For the first time, the Annual Conference of International Speech Communication Association (INTERSPEECH) comes to Singapore, a vibrant city state with rich language and cultural heritage. 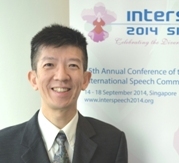 INTERSPEECH 2014 will be held in Singapore on 14-18 September 2014. In conjunction with INTERSPEECH, a series of research workshops and conferences will be co-located in Southeast Asia including Phuket, Thailand and Penang, Malaysia. Building on the success enjoyed by the past conferences, INTERSPEECH 2014 will continue to strive for a comprehensive conference program that covers a diverse field of speech communication science and technology, and that recognizes the importance of both theoretical and empirical approaches to research problems. In 2014, the International Speech Communication Association (ISCA) marks its 26th year of scientific activities and community services, and its 15th event in its INTERSPEECH series. On behalf of the organizing committee, I invite all of you to Singapore to join the flagship conference of our community! Together, we 'Celebrate the Diversity of Spoken Languages'!